Arc of Westchester empowers children, teenagers and adults with autism and other developmental disabilities to achieve their potential based on choices, abilities and interests. Programs include: Early evaluation for infants, toddlers and their families, A preschool program, Transition planning for young adults, Vocational training and job placement, Respite care for families, Recreation and the arts, Guardianship services for older adults. For more information, please contact Anne Sweazey, Executive Director, Arc of Westchester Foundation, 265 Saw Mill River Road, Hawthorne, NY 10552, (914) 495-4625 or visit www.westchesterarc.org. Set on 14.5 beautiful acres in Stamford, Connecticut, 2 miles from the Pound Ridge, New York border, children experience a traditional day camp setting with 3 outdoor (heated) pools, ball fields, game courts, playgrounds, nature trails, group rooms and a fabulous, air-conditioned Arts & Athletics Center. The Camp offers a well-rounded variety of activities such as Expert Swimming Instruction, Archery, Baseball, Basketball, Ropes Course, Cookouts, Music, Dance, Drama, Wrestling, Soccer, Volleyball, Tennis, Miniature Golf, Arts & Crafts, Nature, and Special Events. Ages range from 3-4 in the Nursery through 8th grade in the Older Division. 478 Erskine Road, Stamford, CT (203) 322-0253 www.longridgecamp.com. Classes and programs for all ages and levels. Creative Arts Program: ages 4-12, a focus on art movements and culture are incorporated into classes such as: drawing, painting, mixed media, creative movement, storytelling, and more. Mon-Fri, 9am – 12pm. Other morning programs include: digital photography, ceramics, and more. Afternoon classes in piano and guitar and various other instruments. Workshops include songwriting, voice performance, dance, Manga/cartooning, ceramics, drawing, painting, photography, watercolor, Garageband, writing, and analog/digital photography. The RAC’s Musical Theatre Workshop will feature Disney’s Aladdin: Mon-Fri, 9am – 4pm, ages 8-12. Rye Arts Center, Milton Road, Rye, www.ryeartscenter.org, 914.967.0700. The Rye Arts Center – Year round Creativity with a Focus on Summer Fun! The Rye Arts Center is excited to announce its upcoming summer 2012 class lineup! Plenty of classes and week-long programs to choose from, in a variety of different mediums, for all ages and levels. Once again, the RAC will offer its Creative Arts Program, (ages 4-12) – A focus on art movements and culture are incorporated into classes such as: drawing, painting, mixed media, creative movement, storytelling, and more. Mon-Fri, 9am – 12pm. Other morning programs include: digital photography, ceramics, and more. The RAC offers an array of afternoon programming. Group classes in beginning piano and guitar as well as private/semi-private lessons in various instruments. Other workshops include songwriting, voice performance and dance. Additional afternoon programs in Manga/cartooning, ceramics, drawing, painting, photography, watercolor, Garageband, writing, and analog/digital photography. The RAC’s Musical Theatre Workshop will be in full swing starting mid-August (an adaptation of Disney’s Aladdin). This Mon-Fri, full day program (9am – 4pm) is open to ages 8-12. 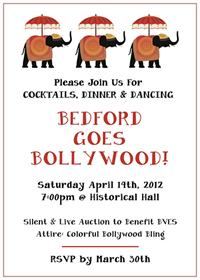 For information visit www.ryeartscenter.org or call 967-0700. Located at 51 Milton Road, Rye, NY. Mark your calendars for the home opener of the 2012 Fox Lane Varsity Baseball season on Tuesday, April 10th at 4:15 vs RC Ketcham a perennial Section 1 powerhouse. This will be the inaugural game in the newly re-furbished FLHS baseball stadium. Two special guests critical to the project will throw out and catch the first pitch. The FLSBC will be selling their cloth seat cushions ($20 per) at the game to keep warm baseball and lacrosse spectator’s bottoms off chilly bleachers. This is a one-time item with limited availability. If you can’t attend the game and want a seat cushion for other chilly spring sports viewing, simply drop the FLSBC a note and we’ll make the necessary arrangements. GO FOXES!! My ‘baby’ is about to have a baby. In my pre-mommy days I worked as a social worker at a high school in the Bronx and I had one student that I just knew was mine. There were lots that I loved. So many who stole my heart and kept me up late at night worrying that they’d be OK. That they would be safe and happy and successful. But there was always one that made me hold my breath. She made me protective and proud and I knew she was somehow mine to look over. When she graduated from high school I was there to watch. When she graduated from college I cried with her mother, tears of joy and happiness at a job well done and of a life well on the road. She took a job in finance and when she called me to say she was going into the nonprofit field I told her not to. She said, what? That’s what you did – and it makes me happy. So, I congratulated her. When she called to say she was getting married, I said what are you thinking? You’re too young, and she said, I’m the same age you were! I said he better love you. I cried at the wedding and watched this man look at this woman and I knew that he did. Years later and I got the call she was going to have a baby and I said WHAT?! You’re too young. And of course she is not. And any day now she will have this baby and I honestly can’t believe it. I know she is going to love that baby to pieces and she is going to cry and suffer and love every second. She will laugh and cry and scream and shout. Because that’s what it is to be a mom. It is love and pain, and it’s the future. It’s beautiful and horrible and everything in between. I don’t know what to say to my ‘baby’ other than good luck, find peace and do your best. Is there more? Love them, care for them, watch out for them, steer them…but most often do your best. This new mother was my first baby. The first one I let get in my heart and scare me. And I can’t wait to watch as she loses her heart to this little life. It is the best pain you will ever face. It is everything you are afraid of, everything you hold dear, and everything you love packaged in the most terrifying bundle of need you will ever experience. Snuggle him. But call me when you can’t. Make rules for him, but call me when you don’t want to. Love him, but call me when you don’t like him. Because there will be those times, and as much as you love that baby he will make you crazy and frightened and miserable to tears because you know you can’t possibly love someone so much that their every breath, sigh or look means the very essence of your being. All of my thoughts and wishes are going out to the new moms out there today as I remember what it felt like in those early days. There’s nothing like it. My heart is full to brimming with memories of holding my own babies, of the wonder, the smell and the feel of those first snuggles. In four one hour class sessions children, ages 6 to 12, will design, hand build and glaze a personalized vase and animal mug. They will learn how to create rich textural patterns in clay and expressive animal faces as well as glazing techniques. When: May 5, 12 ,19, and the 26th, Time: 11:00 am-12:00 pm. Place: Hammond Museum Classroom. Members:$60.00 for four sessions, Non-Members: $80.00 or four sessions. Hammond Museum & Japanese Stroll Garden, North Salem, N. Y. 10560, (914) 669 503, www.hammondmuseum.org. Rippowam Cisqua School lecture series culminates on Wednesday, April 11th with a discussion on Strengthening Parent-Child Connections. The final lecture in this year’s Foundations of Education Series, featuring Tara Brown, educator, coach, and author of Different Cultures, Common Ground, will take place on Wednesday, April 11th at Rippowam Cisqua. The discussion will present strategies for building stronger connections between parents and children and insights into how to nurture children’s passions. Tara Brown’s more than twenty year career as a teacher and coach has taken her from rural schools in Florida, to schools in gang territory in Long Beach, California, and to one of Nashville’s largest high schools, comprised of students from over 35 countries. Through her experiences and work with youth, Tara is recognized as a leading expert in the process of forging effective connections with youth and building relationships between students and teachers. Tara’s belief is that the ability for parents and children to connect with each other and with teachers enables real-life learning to take place inside and outside the classroom. In her presentation, Ms. Brown will share how important it is in today’s fast paced world to take the time to observe the good in our children and to appreciate the gifts and strengths they naturally possess. She will share how this simple action can help uncover our children’s passions. It was a simple, unimpeded passion for film that helped Steven Spielberg on his way to becoming an award winning director, and Bill Gates’ obsession with a school computer in 8th grade that contributed to his becoming the head of one of the most successful technology companies in the world (instead of the lawyer his parents wanted him to be!). What passions could your children have that you just haven’t seen yet? 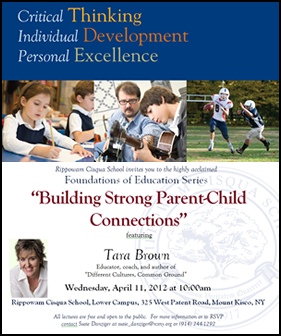 Tara Brown’s lecture is part of Rippowam Cisqua’s highly acclaimed Foundations of Education Series – informative discussions with experts in the field of education and parenting. These discussions are designed to offer parents insights and strategies for raising successful, lifelong learners, and are free and open to the public. They are held the second Wednesday of most months on the Lower Campus of Rippowam Cisqua School at 325 West Patent Road in Mt. Kisco. For more information on Rippowam Cisqua School’s PreKindergarten through Grade Nine program and philosophy, or to RSVP for a lecture, contact Susie Danziger at susie_danziger@rcsny.org or (914) 244-1292. To find out more about Rippowam Cisqua, visit www.rcsny.org. Spring has sprung, and at Mount Kisco Child Care Center, it is time again for our Annual Mother’s Day “Flower Patch” Sale fundraiser. Now through April 26th, orders are being accepted for Calibrachoa, Geraniums, New Guinea Impatiens, Petunias and Marigolds, at $20 each. 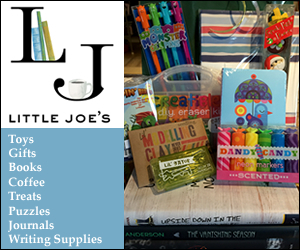 Proceeds from the sale benefit the children of Mount Kisco Child Care Center (MKCCC). To download the order form online, please visit our website. 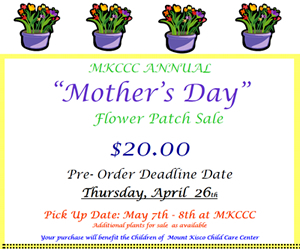 For more information about the “Flower Patch” and/or to place your order via telephone, please contact Renee DeVincenzo at MKCCC – 914.241.2135 or rdevincenzo@mkccc. org. FitQuest at Northern Westchester Hospital, Saturday, May 12, 2012. 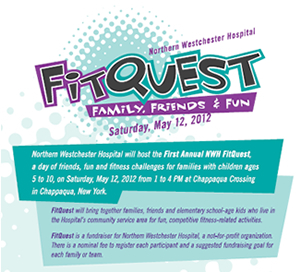 Northern Westchester Hospital will host the First Annual NWH FitQuest, a day of friends, fun and fitness challenges for families with children ages 5 to 10, on Saturday, May 12, 2012 from 1 to 4pm at Chappaqua Crossing in Chappaqua, NY. FitQuest will bring together families, friends and elementary school-age kids who live in the Hospital’s community service area for fun, competitive fitness-related activities. FitQuest is a fundraiser for Northern Westchester Hospital, a not-for-profit organization. There is a nominal fee to register each participant and a suggested fundraising goal for each family or team. Village Green Nursery School is a not-for-profit school established in 1956. The philosophy of early childhood education that you see at VGNS is called Developmental Interaction and was conceptualized at the Bank Street College of Education. We recognize that play is the cornerstone of learning and that children learn by doing. Children also develop a sense of awareness of others and learn to recognize, respect and accept eachother’s differences. Children develop communication skills though their social interactions that will help them develop positive relationships. Please visit our website at www.villagegreennurseryschool.com or call Sam at (914)234-4316 to schedule a visit. First of the Season? You may think I am going to refer to a beautiful flower or a walk or wax poetic about something spring-like — well, I guess I am, but I’m talking about frozen yogurt. My son and I stopped for our first frozen yogurt in a while today post hair-cut — because even though he is 12, I still have to bribe him to get his hair cut — actually maybe even more now that he is 12…but that’s a different story. Anyway, we stopped by Frannie’s Goodie Shop in Mt Kisco and I will admit that I haven’t been in for a while — frozen yogurt in the cold of winter just doesn’t call to me…but it was calling today and oh, so worth the stop. 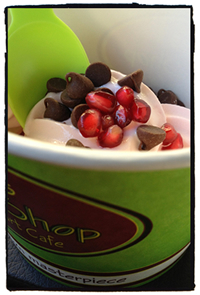 Delicious treats, toppings, and the nicest, most welcoming staff. If you haven’t been to Frannie’s yet or haven’t been in a while, get over there — it’s as good as it looks.